The Timber Ridge Ski Patrol is a non-profit organization of volunteers who are trained in first aid, outdoor emergency care, CPR, and winter rescue. 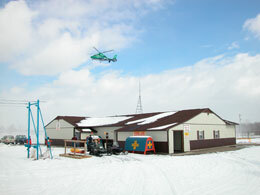 We provide high quality rescue and emergency care services for skiers, snowboarders and snow tubers at the Timber Ridge Ski Area in Gobles, Michigan. We are part of the National Ski Patrol (NSP) system, an international organization that includes 28,500 patrollers who are dedicated to serving the public and the mountain recreation industry by providing educational services about emergency care and snowsports safety. 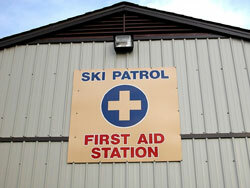 The Timber Ridge Ski Patrol has over 80 volunteer members who have all completed the National Ski Patrol's Outdoor Emergency Care (OEC) course and are trained in cardiopulmonary resuscitation (CPR), automated external defibrillator (AED) use, and the techniques necessary for first aid and rescue during trauma or medical emergencies. Patrollers on the hill also are trained to safely package and transport injured guests down the hill using rescue toboggans. Subsequent examinations can result, if needed, in the patrollers interfacing with EMS services for seamless and rapid transportation to the nearest medical facilities. Timber Ridge patrollers come from a variety of professional backgrounds, including sales, manufacturing and teaching as well as related healthcare fields. Patrollers all share a passion for skiing or snowboarding and a dedication to helping others. The patrol has a large number of OEC, ski, and toboggan instructors who commit additional time to train new patrol candidates and annually refresh current patroller skills. The patrol also has members serving in the National Ski Patrol organization’s various geographical management tiers at the section, region and division levels. While on duty at Timber Ridge, we patrol as agents of the resort and work under the direction of the Timber Ridge Ski Area management as well as NSP. You can readily identify us by our red and black jackets with the white cross on the back. We are among the first ones on the mountain in the morning and we are the last ones off, regardless of weather or snow conditions. 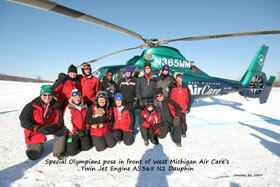 We continually strive to improve our services to the skiing public as well as the ski patrol community. Our patrollers regularly train each other as well as visitors from other ski patrols in the region. Part of the patrol’s responsibility is to promote safety so that all skiers, boarders, and tubers that come to Timber Ridge leave with nothing more than fond memories of a great day. The patrol assists Timber Ridge management by marking hazards, opening and closing trails, and sweeping the entire area each night to ensure all guests are safely off the hill. Patrollers assist with lift-line management and crowd control and help enforce the Skiers Responsibility Code through active communication with area guests.